Arroz Caldo ~ I Can Do That! Arroz Caldo, translation is rice broth, is the Filipino version of Chinese congee. Arroz caldo is not soupy and the consistency is more like porridge. Er, it IS rice porridge flavored with chicken, garlic, ginger, and Spanish saffron and simmered in broth. It's one of many Filipino dishes representing the mixture of Filipino heritage combining Spanish, Chinese, and Filipino flavors. I was cooking the usual chicken arroz caldo the day Joy announced the theme, the photos are below and the recipe is here. I cooked a smaller batch two days ago that didn't have chicken pieces and saffron. I made stock with one chicken breast, lots of chicken skins, bones, and vegetables. The boiled meat was flaked then dry-fried until super crispy and the skins were made into chicharrones. I topped the meatless arroz caldo with the crispy meat and chicharrones together with more crispy stuff, fried shaved garlic and fried scallions. 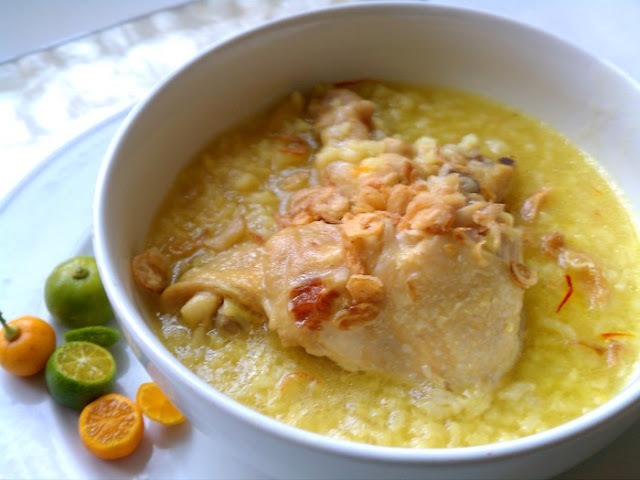 With the juice of one or two calamansi, I had bowlfuls of comforting and warming crunchylicious arroz caldo. Sprinkle safflower on hot stock; set aside. In a large saucepan, heat oil over medium high. Add garlic, onions, and ginger and saute for 2 minutes. Add rice and fish extract and stir fry for 2 minutes. Add 4 cups of the stock all at once, let come to a boil, lower heat, cover, and let simmer for 25 minutes. Check and add more stock if necessary. Ladle into individual bowls. Add toppings. Enjoy. Kulinarya was started by a group of Filipino foodies living in Sydney who are passionate about the Filipino culture and its colorful cuisine. And now, my thoughts on the incorrect translation of Arroz Caldo becoming prevalent in food blogging sites. I have noticed that more and more Filipino bloggers have declared that Arroz Caldo literally translates to Hot Rice. Growing up in the Philippines and having eaten perhaps cauldrons and cauldrons of the stuff, I have always known since age 5 that Arroz Caldo meant Broth Rice or Rice Broth (lugaw). Apparently a popular and highly regarded Filipino blogger wrote Hot Rice translation about 6 years ago and other bloggers repeatedly followed making the same mistake. Although I don't speak and write Spanish, I can read and understand a litle bit and know the Spanish words for hot is caliente and for broth is caldo. The Spanish people in the Philippines at the time enjoying a bowl of Chinese congee would have called the dish Arroz Caliente if they had meant it to be a hot dish but since they, or maybe the Chinese, named it Arroz Caldo, it obviously means Broth Rice. Some wise guy tried to argue by pointing out that caldo in Italian translates to hot or fervent but then Arroz Caldo should have been called Caldo Riso or Risi if he wants to insist on the Italian translation which doesn't make sense since the Italians don't have historical connection with the Philippines and the only Filipino culinary slang word I can perhaps attribute to the Italians is the word chibog (food or eat) which could have come from cibo (food); or maybe it came from the Spanish cebo (fat or to fatten), I don't know. Recently I read that the Philippine government during Arroyo's term proposed to restore the Spanish Language as mandatory subject in High School which was removed in the mid 70s. I think it is a fantastic idea for younger Filipinos to learn basic Spanish because many many everyday words including food items and terms such as sibuyas-cebollas-onions, mansanas-manzanas-apples, apritada-fritada-fried dish, barbecue-barbacoa-barbecue, bistek-bistec-steak, pastel-pastel-pie, etc all came from the Spanish. Learning the language and our history would be a great help in using the correct cooking terms specially for widely read blog posts. Love the crispy chicken flakes and chicken chicharonnes on top as garnish! Oh yeah, the crispy chicharones is a great idea not only adding flavor on every slurp but as beautiful garnishing. Good job and I would say WOW on photography, Oggi! I sooo love your crispy version of arroz caldo! I would definitely enjoy it! 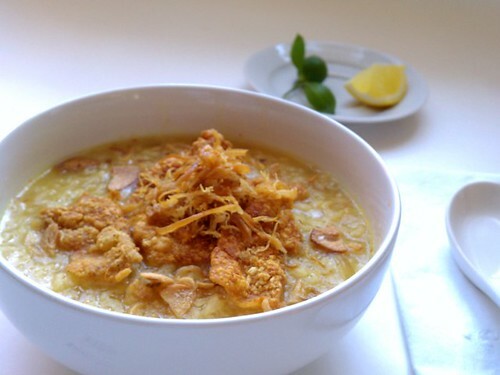 Lots of crispy and exciting treats on top of comforting arroz caldo! What else can be better. I love your Arroz Caldo and all its toppings. The chicharones gives it a special crunch! Thanks for sharing the background history! Very helpful info! I have to agree with others about the crispy chicken. 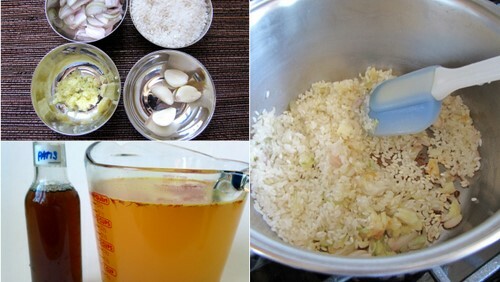 You just gave me an idea to fry chicken skin and add to my Arroz Caldo next time. Thanks for the additional insight on Arroz Caldo. ang sarap naman! Topped with crsipy chicken skin! 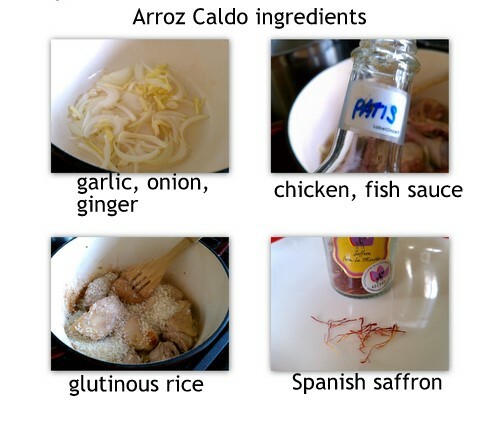 ooh, I have to remember to have chicken chicharon next time I eat arroz caldo. That looks so good, Oggi! P.S. I agree about your thoughts on Spanish language and in our history. They are all inter-related. crispy toppings are the best! glad to be cooking owth you again, Oggi! wow you have kasubha in your arroz caldo! lucky you! it could just be me but it really feels something is missing without it, like a white version will be called lugaw and only the yellow version is a legitimate arroz caldo! hehe! And the chicken chicharon is a nice touch too! Really glad to have joined KCC, it's such a learning experience! crispy toppings... now we're talking. haha but seriously i keep adding chicharon on top my congee too. then spoon it out again and add some more haha. great take on this month's challenge! I knew i was forgetting something from the traditional arroz caldo, chicken floss. Arroz caldo is so yummy and the best ever comfort food!